The Government’s National Infrastructure Commission (NIC) has today published the United Kingdom’s first-ever National Infrastructure Assessment, which among other things calls for nationwide coverage of “full fibre” (FTTP/H) broadband by 2033 and for a related ‘National Broadband Plan‘ to be devised by Spring 2019. “Whether it’s electric or driverless cars, new energy sources, tackling the risk of climate change or preparing for the newest and fastest broadband speeds, the issues we’ve been considering profoundly affect people’s everyday lives. The whole purpose of the UK’s first-ever National Infrastructure Assessment is to think beyond the technologies of today and to ensure we can make the most of future innovations. It’s why it’s not just a one-off but something we will be repeating every five years to ensure we remain on the front foot. This is not some unaffordable wish-list of projects: it sets a clear direction for how to meet the country’s future infrastructure needs, and makes a realistic assessment of what can and should be delivered within the stated aim of Ministers for steady and continued investment over the coming years. “We share the Government’s full fibre vision for Britain. This year we’ll double our FTTP footprint and by 2020, we will have built it to 3 million homes across the UK. We want to reach 10m premises by the mid-2020s, and believe we can ultimately fully-fibre the majority of the UK under the right conditions. This is an expensive, complex, once-in-a-generation engineering project which the industry can only deliver with longer term certainty over the return on investment. ORs comments are quite interesting, clearly referring to not being able to remove copper and what they are allowed to charge for each line, as holding them back. OR have been pretty consistent on that score. The #1 obstacle to wider FTTP in the UK remains Ofcom, as it has been for a while. Perhaps they need to be more vocal about it. No other operator is forced to endure what OR have to, we need to scrap LLU and the restrictions it imposes. Perhaps Ingintiinner would tell me a little more about Ofcom? Presumably someone who pays their wages could go round and light a bonfire under them as needed? 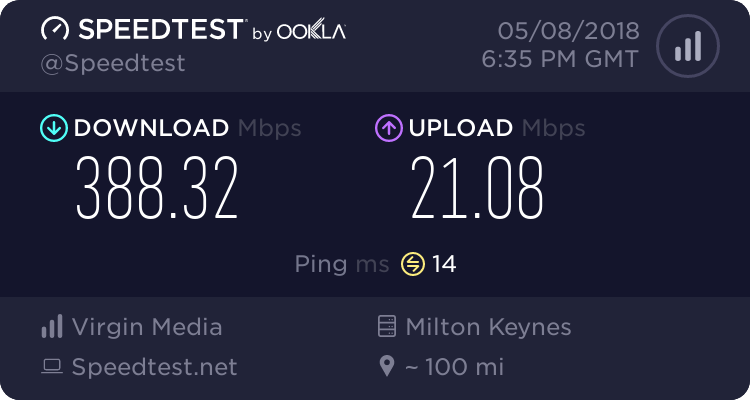 A reasonable and fair solution to me is that openreach are allowed to retire the copper in FTTP areas, but talktalk and sky get first refusal on the copper, meaning if they want to keep their ADSL LLU going they can buy it from openreach and maintain it themselves. I also believe price controls on openreach need to be removed, any pricing regulation needs to be at the retail level only. The wholesale market is so big now that BT group wont willingly destroy it, there will be a degree of self restraint on pricing to keep their wholesale customer base intact. That is a very good suggestion and one that I would happily endorse. But that would mean the power masks to protect ADSL would have to stay in place, which restricts VDSL speeds. yeah I dont think we ever gonna see retirement to improve VDSL, thats not going to be seen in the same degree of importance as costs of rolling out FTTP. It amazes me that there are some people who can only get a decent speed using ADSL technology. The operators have different solutions at their disposal yet don't seem to be trying to move people towards FTTC technology. I think there is something of the Yorkshire man when it comes to how some companies operate i.e. wanting to squeeze the very last drop out of the technology to save a few pennies. Hmm . . . I need to further think about all the implications.